Please click here to view INFACT's Current Newsletter Table of Contents. On May 17th, 1981, not long before midnight, a red-haired baby boy was born. His overjoyed parents named him Daniel Benjamin. He began breastfeeding just minutes after his birth, but within an hour the nurses were urging his mother to give him a bottle of sugar water. And when his mother took him home, she was also given a hospital gift-pack with sample cans of formula, a bottle and a pacifier. That same month there was another birth -- the birth of something that could change the lives of many babies like Daniel. 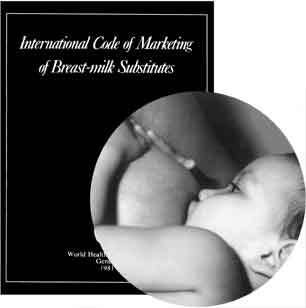 This was a newborn with much potential: the International Code of Marketing of Breast-Milk Substitutes, endorsed by the World Health Assembly in May of 1981. Breastfeeding photo courtesy of Breastfeeding Committee for Saskatchewan. Despite the formula sample and other challenges, Daniel continued to breastfeed for three and a half years. Today he's a healthy twenty-year-old, nearly six feet tall and heading towards his third year of university. At twenty, the WHO International Code has also reached a kind of maturity. But what have those two decades meant to mothers and babies in Canada? Unfortunately, the implementation of the Code in this country has not grown and thrived as Daniel did. The early years were the most promising. Canada, as member state of the World Health Organization, recognized the historical and public health significance of this marketing code -- the first ever for WHO. Members were admonished to "take action to give effect to the principles and aim of this Code as appropriate to their social and legislation framework, including the adoption of national legislation, regulations or other suitable measures." Canada certainly could have developed legislation (as some other countries did) -- for example, by amending the Food and Drugs Act -- to ensure that the marketing code was followed in this country. It didn't. It took, instead, a voluntary approach. Minister of Health Monique Begin nourished the concept of protecting breastfeeding by having a breastfeeding kit developed in the early 1980's to distribute to health professionals across Canada. The kit included a copy of the WHO International Code, as well as resolutions and recommendations passed by various health professional associations. In 1985, the new Minister of Health, Jake Epp, expressed his support for the Code by announcing that the "promotion of breast-milk substitutes to pregnant and nursing mothers is likely to be at the detriment of breast-feeding" and stressing that formula marketing needed to be compatible with the aims and principles of the Code. INFACT Canada produced a slide-tape presentation The WHO International Code Protects Babies and a preview kit was widely distributed to hospitals and health professionals. Did these efforts help? A 1989 survey of these professionals found that 75% of those surveyed were aware of the International Code, and most of these got their information from the Breastfeeding Kit. Had it changed practices? A second survey, conducted in 1992, found that 11.7% had discontinued giving out formula company literature to new or expectant mothers, and 25% had stopped giving mothers formula samples. In 1987 the Canadian Infant Formula Association (CIFA), an association of infant formula producers, introduced, in consultation with the Federal government, their own Code of Practice. The Federal Minister of Health at the time, Jake Epp publicly stated that this industry 'code' was 'in harmony' with the WHO Code. It's hard to know what he meant by "in harmony" since the CIFA code permitted the marketing approaches specifically banned by the International Code. At this time, three companies dominated the infant formula market in Canada: Mead Johnson, Ross Abbott and Wyeth. They relied largely on the endorsement of health care professionals and the distribution of sample packs of formula through exclusive contracts with hospitals -- with excellent results. Ninety-three percent of mothers would continue to use the formula first given to their babies in the hospital. "Nestlé had recently been charged in nine U.S. states for misleading and deceptive advertising of Carnation Good Start formula ... marketed in Canada as a ... remedy for colic and allergies." In 1990, Nestlé muscled in on the game. The nine-year-old WHO Code, already weak in Canada, was clearly no match for this player. Although Nestlé had recently been charged in nine U.S. states for misleading and deceptive advertising of Carnation Good Start formula, it was marketed in Canada as a new formula that offered a remedy for colic and allergies. To protect their market, the other three companies negotiated even larger contracts to provide free formula to hospitals, sometimes getting into bidding wars with each other. Shut out in this area, Nestlé began to advertise in Canadian parenting magazines, on shelf 'talkers' (signs attached to the grocery store shelves where the product is sold), in brochures asking mothers to register for 'clubs,' through tear-outs in magazines offering free formula, and through physicians' offices. Nestlé's most aggressive approach, however, was to target mothers directly through Canada Post. Mothers began to receive Nestlé mailings and free formulas throughout pregnancy and during the first year of their infant's life. Nestlé's competitors were quick to follow this example. By the early 1990's, Nestlé had launched an anti-trust complaint with Industry Canada against its competitors. Subsequently CIFA was disbanded and a marketing free-for-all ensued. The US-Canada Free Trade Agreement (FTA) had an immediate impact on infant feeding policy in Canada. INFACT Canada and its members had been lobbying Health Canada for the regulation of the infant formula industry and the implementation of several direct marketing aspects of the International Code for several years by now. But by the summer of 1991, INFACT Canada was told by representatives of Health and Welfare Canada that the World Health Organization International Code of Marketing of Breast-Milk Substitutes was now "superseded by the FTA with the US." And, they continued, The International Code is perceived to be a "restriction on the rights of the formula manufacturers to compete freely in the market place." The right to market was deemed more important than infant health. In 1995, the Canadian Institute of Child Health and Health Canada surveyed 576 hospitals and found that almost half of the hospitals reported routinely giving breastfed babies water, glucose or formula; about one in four routinely gave breastfeeding mothers formula samples in gift packs, and 82% had an exclusive contract with a formula company. Since parents look to paediatricians as caretakers of their children's health, it seems natural that the Canadian Paediatric Society (CPS) would strongly support breastfeeding and any means to protect breastfeeding. After all, some 15,000 research studies point out the risks of formula feeding to the health of infants and children. In fact, the CPS has been disappointingly unsupportive. For example, it was found that more than 70% of paediatricians gave out free samples of formula in a 1990 study, as compared to 53% of family practitioners. The formula industry funds conferences, events and research for CPS members, and provides literature to be distributed from their offices. "The CPS has been disappointingly unsupportive ... more than 70% of paediatricians gave out free samples of formula as compared to 53% of family practitioners." CPS has made public statements on the need for specialized formulas for premature and low-birth weight infants; has rejected the use of human milk banks as a source of human milk for high-needs infants who are unable to receive their own mother's milk; has repeatedly endorsed industry promotions such as the Mead Johnson promotion of vitamin D supplementation from birth; gives professional endorsement to the industry through its relationship of sponsorships and joint promotions; and puts infants at risk for being artificially fed by engaging in feeding trials for the purpose of creating marketing strategies for artificial feeding products. Even though breastmilk banking has been on the rise in other industrialized countries such as France and Britain, as well as developing countries (Brazil, for example, has over 150 breastmilk banks) the CPS has actively promoted the closure of Canada's only bank. In 1998 the Canadian Paediatric Society, jointly with Health Canada and Dietitians for Canada produced "Nutrition for Healthy Term Infants" a document which has received a number of criticisms. For example, beginning solids is recommended between four and six months -- ignoring more recent WHO resolutions encouraging exclusive breastfeeding for six months. While the document says that breastfeeding 'may' continue for two years, there is no other mention of breastfeeding after 12 months of age. Vitamin D is recommended for all breastfed infants from birth, without taking into consideration other factors. The risks of formula are not mentioned. This document relies heavily on input from Dr. Stanley Zlotkin and Donna Secker of the Hospital for Sick Children. Both are used as consultants by Mead Johnson and Nestlé. They are the nutrition consultants in the Nestlé Good Start magazine touting the Nestlé formulas and cereals. This is a clear conflict of interest that should not be permitted in public policy development on infant nutrition. Health Canada set up the Expert Working Group on Breastfeeding in 1991 which eventually became the Breastfeeding Committee for Canada. This Committee has declared itself to be the implementing agency for the Baby-Friendly Hospital Initiative (BFHI). Canada has assessed and certified its first Baby-Friendly Hospital in 1999 -- the Brome-Missiquoi Perkins Hospital in Quebec. Several others are close to being ready for certification. How is our twenty-year-old Code doing today? It's struggling against some powerful opponents, but there are some bright moments. Breastfeeding rates continue to increase, thanks to hard work by many advocates, supporters and medical professionals. Women are also breastfeeding longer than in the past. That's all good news, but many women continue to wean earlier than they had hoped to, and too many of these cases can be traced back to a free sample of formula or an ad that promised formula would end baby's colic. In the next five or ten years, Daniel Benjamin may well be thinking about starting a family. Will his children be born in an environment where breastfeeding is protected? Or will formula arrive at his home even before they are born, with new samples timed to arrive at those times when breastfeeding is sometimes a challenge? Will his child's doctor attend conferences in infant nutrition sponsored by formula companies, or conferences on how to help breastfeeding succeed? For 20 years now the International Code and the important resolutions that have been added to it to block loopholes have been the vital instrument to hold the industry accountable and liable for the results of its marketing and its products. The need for Canada's government to implement the Code's articles in a way that will truly protect breastfeeding and allow women and children the enabling environment without pressures from commercial interests is as necessary today as when the Code was first adopted in 1981.